MAKATI CITY, Philippines -- It was a moment of emotion and pride for the 25 year-old Filipino IBO Bantamweight World Champion Michael Dasmariñas, 25, when the Republic of the Philippines Games and Amusement Board (GAB) Chairman Hon. 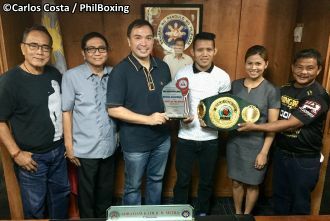 Abraham Kahlil B. Mitra commended him and handed him his award as best Filipino boxer of April in a meaningful ceremony at the GAB Head Office today in Makati City, Metro Manila, Philippines. "This is our government's recognition to your effort and dedication to the sport of boxing. You being a sports role model to the our young ones is so important to us. So we shake your hand and wish you all the best in your boxing career," said the GAB Chairman Mitra to the boxer, prompting the applause of the audience, which included GAB's Boxing and Contact Sports Division head Dioscoro B. Bautista. A heavy-puncher leftie, Michael Dasmariñas - who hails from the sun-bathed paradise beach island of Camarines Sur - claimed the International Boxing Organization (IBO) 118 Lbs., title by knocking out the European Bantamweight Champion Karim Guerfi (27-4, 8 KO's) of France in a 4-round stoppage last May 25 in Singapore. In attendance during the ceremony were GAB Chairman Hon. Abraham Kahlil B. Mitra, GAB Boxing and Contact Sports Division Head Dioscoro B. Bautista, GAB Chief Secretary Ms. Jackie Lou Cacho, International Boxing Official Silvestre Abainza, GAB Team leaders Eduardo Coronel, Oliver Evangelista and Dasmarinas' head coach Epetacio "Tacy" Agapay. "Fantastic. I am happy to have played a part in Michael's rise to success. Michael Dasmariñas (28-2, 19 KO's) next fight is against Venezuelan Alexander Muñoz (40-7, 31 KO's) a 3-time world champion. The non-title fight will be on September 29 here in Singapore. After that, Michael will be defending his IBO world-title later this year or in early 2019, possibly in Manila, Philippines. "In addition, I am looking for a place in the World Boxing Super Series as Michael deserves to be included. In fact, we are open to fight any of the top-3 bantamweights in the IBF, WBC, WBA and WBO anytime, anywhere. Michael is truly ready," shared the CEO of Ringstar Boxing, the top boxing outfit in Singapore. Photo: GAB Chairman Hon Abraham Kahlil B. Mitra commends IBO Bantamweight World Champion Michael Dasmarinas today in Makati City, Philippines.